Morondava is a picture-postcard town in the Menabe region in south west Madagascar. 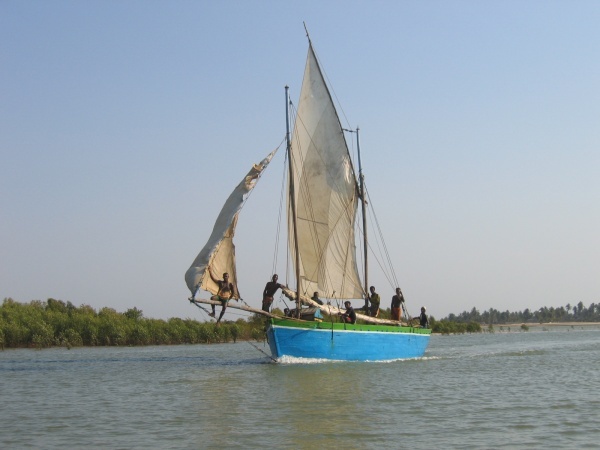 In former times Morondava was a centre of the Sakalava Kingdom and a popular stop-over for sailors. Today the area is rich in sugar and rice farming, while remaining a popular stop-over in particular for tourists travelling to and from Tsingy de Bemaraha National Park. As the population has grown in the region the forests have also been gradually cut down, except the baobab trees which the locals has preserved for religious reasons. However, unfortunately deforestation to make way for sugar cane plantations continues in large areas including some of the remaining baobabs. Morondava can be reached by a 700km drive from Antananarivo. However, the road conditions in the latter part of the journey, the 120km between Miandrivazo and Malaimbandy, are especially poor and can take six hours. The entire drive can take between 11 and 18 hours. As such, Morondava is best reached by plane. There are daily flights by Air Madagascar connecting Antananarivo and Tulear. Nearby attractions include Kimony Beach (2½ hour walk), Kirindy Forest (40km northeast), Baobab Avenue (15km east), Belo sur Mer and Kirindi-Mitea National Park (70km south) and Tsingy de Bemaraha (150km north). Scenic charter flights over the most spectacular areas of Tsingy de Bemaraha can be booked in Morondava at the Baobab Café. Available aircrafts are Cessna 172 (max. 3 passengers), Cessna 210 (max. 5 passengers) or Cessna 421 (max. 7 passangers). Air charters elsewhere in Madagascar can also be booked here. About 12km from town enroute Baobab Avenue is Parc Menabe, a small zoo including a couple of lemurs, a crocodile, various chameleons and a collection of green Malagasy lovebirds. Additionally, this is an ostrich farm set up by a South African ex-patriot who brought the ostriches to Madagascar. As such, Morondava may be the only place in Madagascar where ostrich meat can be found on restaurant menus. Update March 2010: As a result of a downturn in tourism, this zoo along with the ostrich farm have closed. However, the animals are still roaming around the park area and are being fed by a zoo keeper. Taxi de la mer is a boat transfer that runs twice a week between Morondava and Belo sur Mer and which takes about 2½ hours. The price is 50,000 each way. Reservations can be made at the office in the port or at the Hatea Café on Nosy Kely. Tel: +261 032 0469261. Morondava offers plenty of accommodation alternatives, ranging from budget backpacker rooms to comfortable beach bungalows. The hotels are either in the town or on Nosy Kely peninsula, a few minutes walk from the town centre. This page was last modified on 3 January 2017, at 15:06.